When will the market crash? We don’t know. Neither does anybody else. Below is a chart that sums up that reality pretty well. Pick a scenario, any scenario. Or write your own line on the chart. If Italy comes apart at the seams today and yields soar limit-up, no technical analysis in the world can predict the fallout from such cataclysm. Knowing nobody can predict the exact timing of the collapse of reckless financial policy and behavior that has left markets historically overvalued is an opportunity to prepare for the inevitable. Time spent wondering when it will happen is better spent figuring out how to position your holdings accordingly. 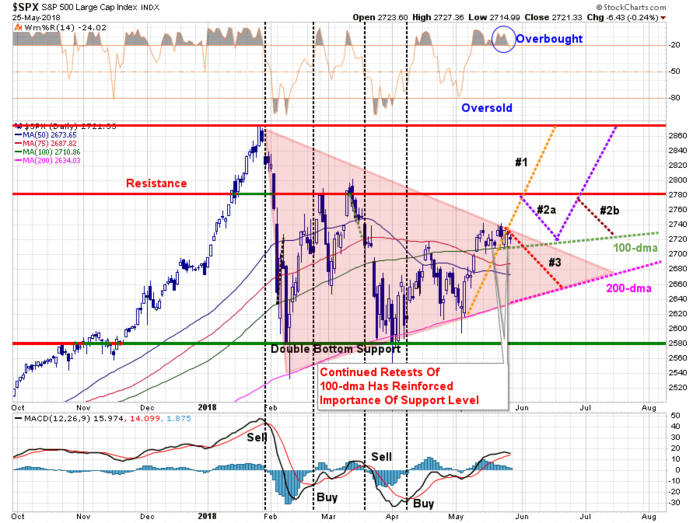 The important point is to consider the possibility of a more sustained correction process. While we have no idea exactly “when” a correction of magnitude will occur, we do know it will. Ignoring the “risk,” and failing to take some action to mitigate the potential destruction of capital in the near-term, has historically had irreparable long-term consequences. This “time is not different,” and there will be few investors that truly have the fortitude to “ride out” the next decline. But then again, if you do “ride it out,” the mathematical reality is that “getting back to even“ is not a successful investment strategy to begin with.